All eyes are on Copenhagen this month as the drama events of the UN Climate Change Conference play out. But those eyes aren’t just the ones of climate change activists and greenies. Multinationals are just as involved – even global beverage giant, Coca Cola, is descending on the Danish capital. Working with other media, marketing, tech and creative partners, including DuPont and Gap Inc., Coca Cola was instrumental in launching the Hopenhagen campaign. The result? An interactive online campaign as well as lots of exposure on the ground in Copenhagen. 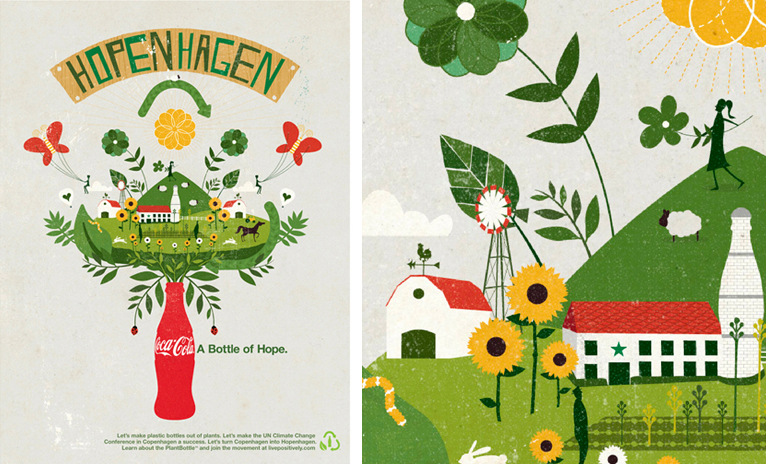 Known for its creative advertising and branding, Coca Cola released a special Hopenhagen set of posters, seen all over town for the duration of the conference. On Coca Cola’s Hopenhagen website, the company encourages visitors to take action against climate change and learn more about recycling and water as well as Coca Cola’s plant bottle, a soda bottle made form 30% plant-based materials (that means it’s still 70% plastic!). But supporting a good cause shouldn’t come without questions.